The Isle of Man Commonwealth Games Association announced Team Novo Nordisk's Sam Brand would represent Team Isle of Man at the 2018 Commonwealth Games in April. 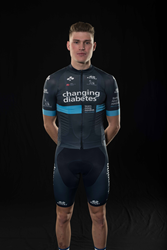 Team Novo Nordisk's Sam Brand will represent Team Isle of Man at the 2018 Commonwealth Games in April. Since moving up to Team Novo Nordisk’s professional squad as a stagiaire, he’s put together some strong performances at the top level of the sport. We are proud to have one of our athletes compete at the Commonwealth Games and show the world what is possible with diabetes. The Isle of Man Commonwealth Games Association announced Wednesday that Team Novo Nordisk’s Sam Brand would represent Team Isle of Man at the 2018 Commonwealth Games when it kicks off in April in Australia’s Gold Coast.